- There about 2250 subscribers to the system. 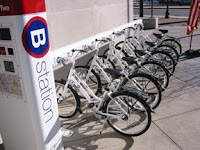 - Through May 28, 738 bikes have been dispursed over 144 stations with a ratio of about 2 racks per bike. - Almost 26,900 trips have been taken on BIXI of which 11,000 have been non-subscription casual users (or about 2.2 trips per bike per day). This is higher than the smaller Washington, D.C. system which earns around 1.5 trips per bike per day, but less than 7 trips per bike per day in the Lyon and Paris systems. 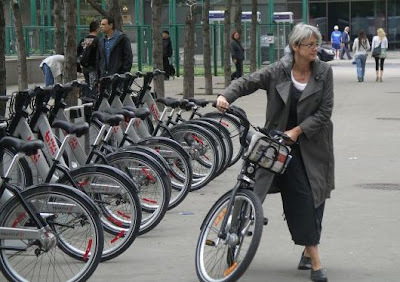 There have been a few growing pains as the system strides to its goal of 3,000 bikes with 300 stations in the central core of Montréal by June 7. During the first days, the National Post reports that bikes were locked in place because of erroneous or mischievious "repair required" indications. Comments of difficulty in taking a bike more than once on a day pass were expressed on the blog spacingmontréal, which showed that more explanation is sometimes needed. The Bike-sharing Blog hopes to keep you up to date on the BIXI experiment. Equal distribution of bikes is one of the hardest nuts to crack with bike-sharing, especially if your program has 20,600 bikes. 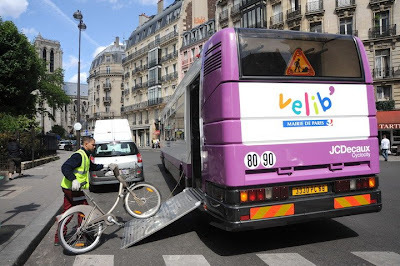 The creative minds of Vélib' have developed a formidable solution to this problem - take a bus! Starting May 4, the first of two Vélib' buses began transporting bikes from stations with an over-supply to those in need. The buses hold 62 bikes each, which is nearly three times more than the trucks which are used now for smaller stations. Staff simply walk the bikes onto the bus and with the use of a pulley system, raise one bike at a time, and send it to the other end of the bus via a roller system to keep the bikes compact during transport. Another reminder that bike-sharing complements other forms of transit and is complemented. 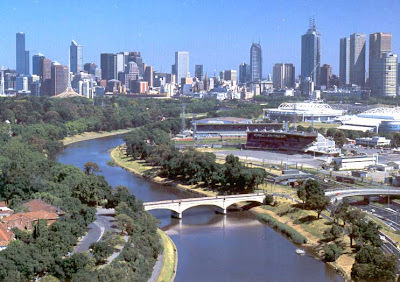 The Victoria, Australia Department of Transport released a Request for Tender (RFT) to find an operator of a bike-sharing program for Melbourne. According to the Department of Transport's website, "The Public Bicylce [sic] System will provide bicycle stations in key locations around inner Melbourne and give the public access to bicycles from the system 365 days a year, for short, inner-city trips. 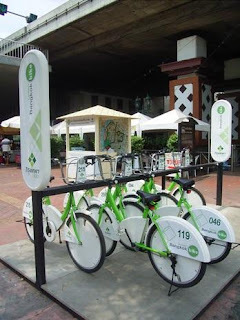 The total system, upon start up will have about 600 bicycles within the inner city." A briefing session will be Monday at 10am for parties interested in learning more. The tender closes on June 18.
p.s. - The bike-sharing program operator should also include a spellcheck program in their tender for the Dept. of Transport to help them spell "Bicycle" correctly. Of course, we here at The Bike-sharing Blog never make a misspellin. JCDecaux pulled out of bidding for Melbourne’s bike-sharing tender competition. Steve O’Connor of JCDecaux Australia says that the Melbourne plan for 600 bikes is too small and lacked commercial incentives according to Australia’s The Age. JCDecaux won the tender for Brisbane’s 2000 bike system and is currently installing the program there. Happy Birthday to The Bike-sharing Blog! 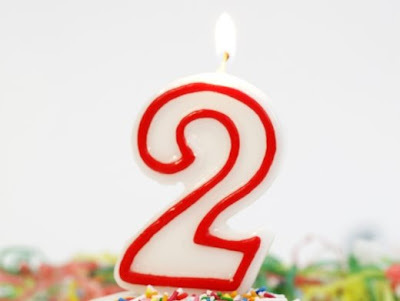 It turns 2 today. If The Blog were a child, it would be a toddler already. The Centers for Disease Control and Prevention describes this stage of life as, "During this time, your child is becoming increasingly more mobile, and aware of himself and his surroundings. During this stage, your toddler will show greater independence, begin to show defiant behavior, [...] and imitate the behavior of others, especially adults and older children." Much of the same can be said of bike-sharing in general: it assists people in becoming more mobile and aware of themselves and their surroundings. Bike-sharing is helping people show greater independence away from the automobile. We are showing defiant behavior by denying the status quo of automobile-dominated societies and launching ourselves into the post-carbon age. We are imitating the behavior of greener societies which have placed greater demands on the mobility and flexibility that bicycling offers and are receiving the benefits of being healthier societies, or of one day striving to become one. Your contributions about local bike-sharing activities have been tremendous and enhanced The Blog's efforts towards advocating for bike-sharing around the world. Thank you for your continued interest in bike-sharing and The Bike-sharing Blog. - Jean-Sébastien Decaux, JCDecaux, France, spoke about "Public bicycles in Brussels. Why they have a future?". My presentation was titled "Bike-sharing: its History and Future" and can be downloaded now. The others' presentations should be available on the Velo-city website in two weeks. Each presentation was insightful and well worth a view. 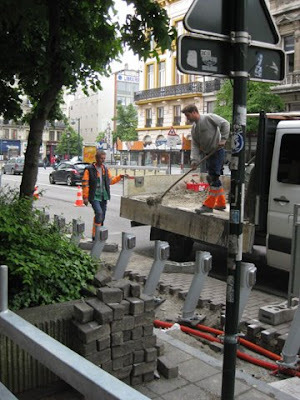 While in Brussels I got to see the preparations for the relaunch of Villo!, the region's new and improved bike-sharing program. The program got off to a poor start a few years ago, however, now it's coming back with a greater number of bikes and stations to tame this city of autos. The reincarnated program will have 2,500 bikes at 180 stations and will be available in the 16 cities of the Brussels capital region. The service will be offered year-round by JCDecaux through an advertising contract. The bike facilities in Brussels are decent, with cycle tracks and bike lanes. However, these facilities generally they aren't being used. Offering bike-sharing on this greater scale will provide a solid option in moving about the compact medieval city and its surroundings to make a dent in the auto-centric behavior and begin to foster a bike culture. 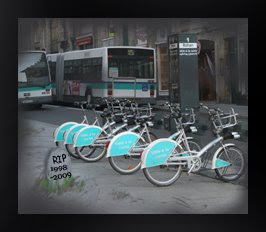 On Sunday May 10, 2009 the world’s first public automated information based bike-sharing program shut down. Vélo à la Carte started in 1998 by Clear Channel Adshel in Rennes, France ended its 11 years of almost free service in this capital city of Brittany. Vélo à la Carte is credited with starting the 21st Century bike-share revolution now spot lighted on the world stage with Vélib in Paris. A bicycle revolution that is now spreading to cities all over the world. With only 200 bicycles over 25 stations in a city with 200,000 inhabitants, Vélo à la Carte has seen almost 1 million usages with 11,000 yearly subscribers. It was the first system deployed for the general public in a metropolitan area utilizing a RFID (radio frequncy identification) card to access the bikes. Do not shed a tear for the Rennais. Although, they will no longer have Vélo à la Carte, they will have a complete menu of 900 new le vélo star bikes in 40 stations starting June 6, 2009. In the near future, it will serve a larger area plus the suburbs with 1285 bikes and 117 stations . Le vélo star system keeps Rennes as an innovator in bike-sharing. The regional transit card, Kerrigo, will also access the bikes. A spokesperson for Clear Channel said that Vélo à la Carte was part of a street furniture (bus shelters) program in Rennes. The contract exspired recently. 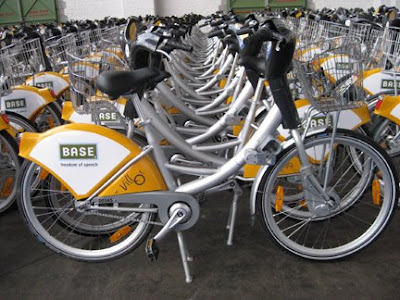 Rennes tendered the new street furniture and bike-sharing as two sepearate contracts. Clear Channel won the street furniture tender maintaining its advertising presence in the City. Keolis won the bike tender and will start operating the scheme in June. Kéolis’s contract will have no link to advertising. Starting this week, as a way to increase awareness of Bike-sharing down under, Common Bike is offering a three week bike-sharing program in Melbourne, Australia. The demonstration is organized by students with the assistance of Ronald Haverman of Bike Sharing Solutions from the Netherlands. As reported in the The Age, the demonstration coincides with the Melbourne Road Minister's plan to ask for a tender offer to be issued for a large bike-sharing program there. 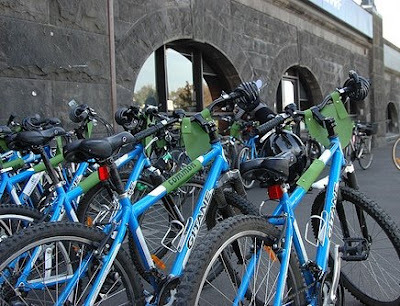 Mr. Haverman said that public bike hire would be good for Melbourne continuing, "I think it's good for the very spread-out suburbs, the low-density areas, you need bike stations almost everywhere." Watch a video of the RMIT student run bike-hire demonstration. Residents and tourists enjoy Green Bangkok Bike in Thailand’s capital. The manual system began last August with 300 bikes and eight service counters and stations. It serves the historic Rattanakosin section of Bangkok and is run by the Bangkok Metropolitan Administration. There is no cost as long as you can provide a valid national ID card or passport. As the images of last summer’s Bike-sharing experiment at the 2008 Republican and Democratic National Conventions in Minneapolis and Denver fade from our memory, so does the realization of bike-sharing systems in both those cities in 2009. Both Minneapolis and Denver had planned to have systems up and running this summer. In March, Minneapolis announced it was postponing its 1000 bike Nice Ride program from spring/summer 2009 to summer 2010 Bike-sharing Blog March 16, 2009. Yesterday, Denver postponed its 600 bike Denver B-cycle debut until spring 2010 as reported in Westword. BIXI begins in Montréal on Tuesday May 12, 2009!